What does Atsushi Inaba have up his sleeve? Remember Vanquish? You know, the third-person sort-of Halo-esque shooter from 2010 that only featured on PlayStation 3 and Xbox 360 consoles? Well it might, might, be coming to PC—if there’s anything to be read from Atsushi Inaba’s less than subtle comments during a recent interview. "AARON: Is there any possibility that Vanquish will get a PC version? 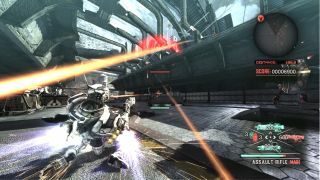 KOTAKU: It would be a good idea to release Vanquish on PC. INABA: (smiling) Hrm. I wonder... If you stop recording, I can talk about that. (laughs)"
Take from that what you will, but it sure would be nice to see Vanquish join the likes of Valkyria Chronicles on the list of once console-exclusives that’ve made the jump to PC. I still fondly recall blasting my way around the former’s futuristic world, sliding 50 yards on my knees along a concrete floor, through an enemy robot’s legs, before then shooting it on the bum on the way past—it was purposefully ridiculous at times, but great fun nonetheless. Fingers crossed and all that, but in the meantime the interview linked above is worth reading in its entirety if you’ve got the time.